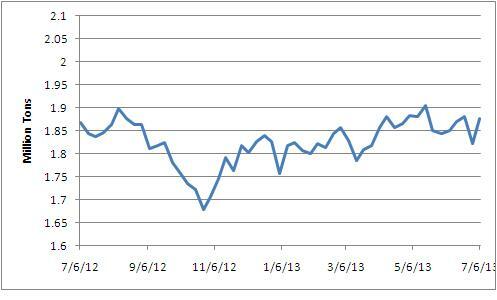 Steel casting shipment appear from my latest analysis for the past year to be coincidental with steel mill production. Both products experienced a decline since late in 2012 based on the reported shipments of mill products from AISI and our own SFSA trend cards. Steel mill shipments have declined less in a year to year comparison since February. 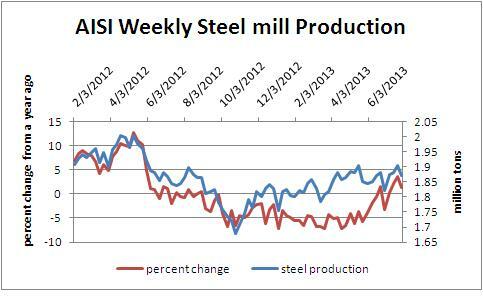 The weekly steel mill production percentage change shows stable production compared to a year ago for the past 4 weeks. 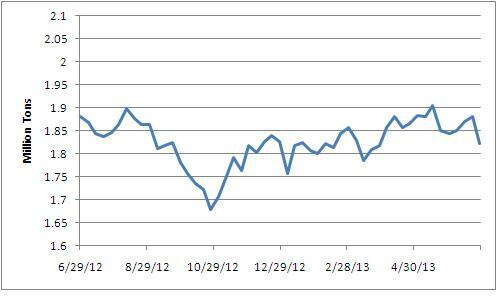 The actual level of production shows relative stability since the beginning of 2013. Bentley University economics professor and blogger Scott Sumner goes even further. "In the world of Keynesian economics," he recently declared, "spending can soar much higher, and they’d still insist that austerity is occurring. 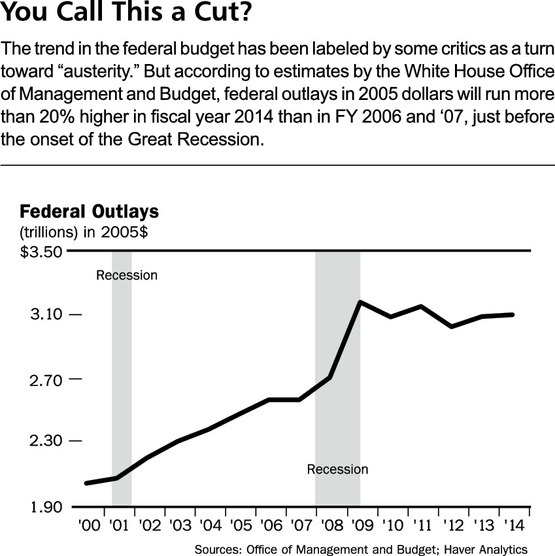 If the Keynesians are to be believed, we have savage cuts in government spending in America, despite data showing spending levels much higher than before the recession." The chart on this page, tracking inflation-adjusted federal outlays generated by the White House’s own Office of Management and Budget, confirms Sumner’s point. We might call it "austerity" if constant-dollar outlays were headed back to the level of fiscal years 2006 and ’07, just before the onset of the Great Recession. But even then, it would be a stretch. Real spending in ’06 and ’07 was at a peak up to that point: As a share of nominal gross domestic product, spending ran 19.9%, up from a 10-year average through 2005 of 19.2%. Yet the trend has been anything but austere. After the surge in spending through 2009, real outlays have been on a plateau, with the OMB’s projection for 2014 running more than 20% above the level of ’06 and ’07. At more than $3 trillion, real spending in 2014 is projected to run 2.5% below the ’09 peak, with nominal spending running 7.3% higher. To call that austere would be like calling it ascetic when you manage a 2.5% decline in a daily calorie intake of 3,500. Yet the experiences of Japan, Malaysia, the United Arab Emirates and the U.S. show an uncanny correlation between architectural one-upmanship and economic doom. In the 1920s, for example, New York’s Chrysler and Empire State buildings opened amid the Great Depression. Later, New York’s World Trade Center and Chicago’s Sears Tower presaged fiscal crises and the breakdown of the Bretton Woods system. In the late 1990s, Kuala Lumpur’s Petronas Towers opened at the height of the Asian crisis. A decade later, Dubai’s economy hit a wall right on cue as the 828-meter Burj Khalifa was getting its Guinness World Records mention. Skyscrapers are akin to giant punctuation marks made of steel, glass and concrete, screaming, “Check us out!” More than technological progress, they usually reflect hubris. Exaggerated pride and easy credit — terrible bedfellows in the best of times — fuel irrational growth and valuations; they drive developing nations toward overreach. This is precisely where China finds itself in 2013 as the economy’s excesses spark fears about financial turmoil, debt defaults and social instability. China will have to be very lucky to avoid the skyscraper curse. The Changsha project is a particularly interesting metaphor for China’s economy. The blistering pace at which the building will go up — more than two stories a day — raises serious concerns. Broad Group’s claim to fame is prefabricated steel and concrete modules that supposedly make construction cheaper and more ecologically friendly. Last year, it put up a 30-story hotel in just 15 days. Yet how well can a 202-story building that is essentially a giant Lego set withstand earthquakes, extreme wind or fire? Steel production rose again last week. The modest increases in steel production suggest that markets for steel castings should improve modestly as the year progresses. 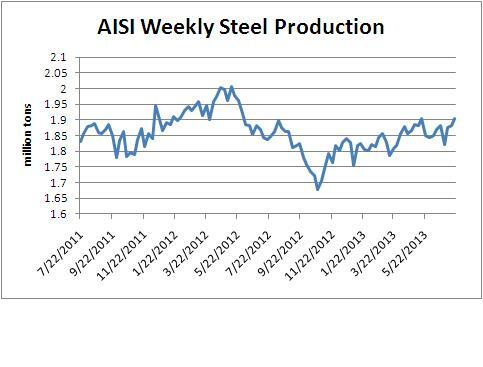 Steel production has continued to slowly increase but remain at a sluggish level for the year. It appears that if this leads steel casting production that we should anticipate a slow increase in demand from our current level. Acknowledging that current cost-recovery policies burden businesses, President Obama’s Treasury Department authored a 2010 paper: "The Case for Temporary 100% Expensing: Encouraging Business to Expand Now by Lowering the Cost of Investment." The paper found that full business expensing would "lower the average cost of capital for business investment by more than 75%. Through temporary 100% expensing, Treasury estimates that businesses’ average cost of capital on new investments would fall from 7.18% to 1.68%." Sounds like a good plan. And what might the effect of a reduction in investment costs be? Economists who studied prior accelerated depreciation experiments in 2002 and 2003 estimated that these policies increased GDP by $10 billion to $20 billion and were responsible for the creation of 100,000 to 200,000 jobs. In 2002 and 2003 businesses were allowed to immediately deduct only 30% of their investment costs. If businesses were allowed to deduct all of their expenses, GDP and employment gains would likely have been even greater. Steel mill production is correlated with steel casting production. It can be a leading indicator. 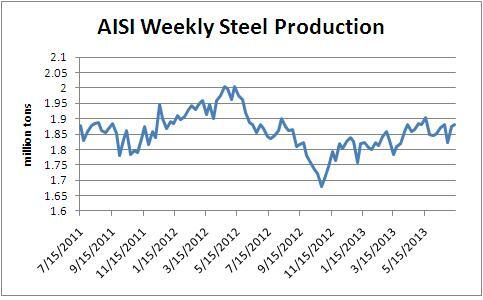 The graph of steel mill weekly production shows a stagnant steel market with no ongoing growth since around March. Between 2002 and 2012, global carbon dioxide emissions rose by 8.4 billion tons. Over that time frame, U.S. carbon dioxide emissions (5.8 billion tons last year) could have gone to zero and yet global carbon dioxide emissions still would have increased. In fact, over that same period, carbon dioxide emissions from Asia alone grew by nearly 7.4 billion tons. Thus, as the latest BP data shows, just the increase in Asia’s carbon dioxide emissions exceeds the total emissions from both North America (6.9 billion tons in 2012) and Europe (7 billion tons).Global carbon dioxide emissions will continue rising rapidly because the world needs energy. Projections from the U.S. Energy Information Administration show that by 2035, global energy use will rise by about 50 percent, to some 370 million barrels of oil equivalent per day. 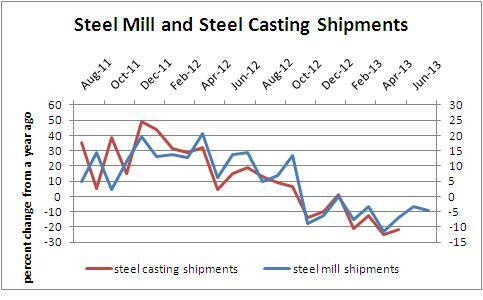 Steel mill production appears to be a leading indicator for steel castings. This week suggests that after a sharp fall from a peak production of over 2 million tons in May 2012and a bottom of less than 1.7 million tons in Oct 2012 steel mill production is stable between 1.8 and 1.9 million tons. There is no indication of continued recovery or growth in the last month.